Following a loss to No. 2 Kansas last Friday in Brooklyn, No. 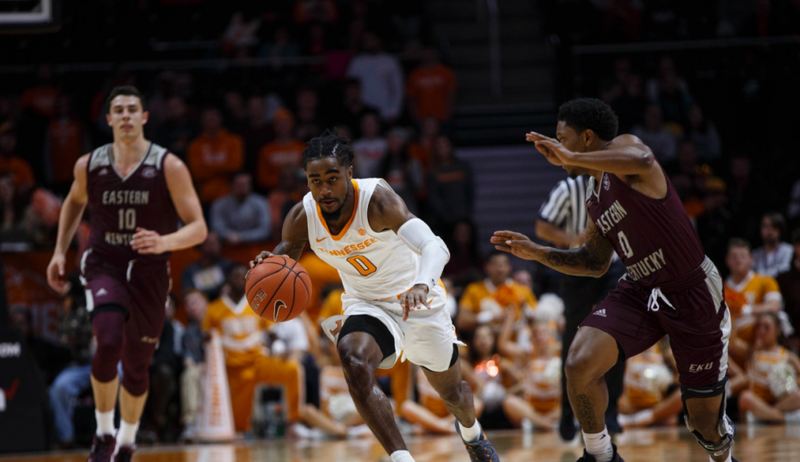 6 Tennessee returned to the court on Wednesday night in Thompson-Boling and defeated Eastern Kentucky 95-67. Wednesday night marked the 500th game in Thompson-Boling Arena history for the Vols, and they put on a show for fans in attendance. The Vols (5-1) were paced by Grant Williams and Admiral Schofield. Williams scored 21 points and Schofield dropped in 20. Jordan Bone and Yves Pons were the other two Vols to reach double-figures, scoring 14 and 10, respectively. Pons kicked things off, drilling a 3-pointer and grabbing two offensive rebounds in the opening minutes during his first career start. Tennessee claimed a 9-5 lead with 15:50 remaining in the first half thanks to a 6-0 run. The Vols’ run would extend extend to 18-3 and was punctuated with a Pons block. Tennessee would then blow the roof off Thompson-Boling following an Harlem Globetrotter-esque sequence. After a steal on the defensive end, Bone threw an ally-oop to Pons who nearly tore the rim down. Grant Williams then blocked a shot and tossed it ahead to Jordan Bowen, who threw down a ferocious slam. At the half, the Vols led the Colonels 49-28. Admiral Schofield led the way with 1o points while Williams chipped in nine, and Pons had eight. UT out-scored Tennessee 22-10 in the paint and had 12 fast break points to EKU’s two. Tennessee continued to shoot a high clip in the second half, out-scoring Eastern Kentucky 46-39 on 53.1 percent shooting from the field. The Vols assisted on eight of their 17 made baskets to close out the game. At the final buzzer, Barnes’ squad dominated all of the “hustle” stats. Tennessee out-scored Eastern Kentucky 48-20 in the paint, scored 25 points off 20 EKU turnovers, had 18 second chance points, and scored 14 fast break points to the Colonels’ four. The lone black eye was bench points, which Eastern Kentucky out-scored Tennessee in, 25-23. Here are our observations from Tennessee’s dominating win over Eastern Kentucky. “Flight 35” was on full display Wednesday night in Pons’ first career start. Not only did the sophomore have two ridiculous dunks and a block in which he pinned the basketball to the backboard with two hands, Pons had a career night. The French native scored 10 points on 4-of-5 shooting, including 2-of-3 from beyond the 3-point line. Pons added five rebounds – three of which were on the offensive glass – two blocks and an assist in 22 minutes. Some underclassmen are nervous starting their first game, but according to Pons, he was just focused on going out there and being the defensive playmaker he takes pride in being. Williams and Schofield are the glue to Tennessee’s basketball team. As peanut butter and jelly go, as do the Vols. Against Eastern Kentucky, such was the case. The dynamic duo combined for 41 points on 14-of-19 shooting from the field. They also hauled in a combined 15 rebounds, had six assists, and blocked three shots. Williams had a slightly better night, recording a double-double with 21 points and 11 rebounds. He shot 6-of-10 from the floor and was a perfect 9-of-9 from the free throw line. The junior also picked up five assists and blocked three shots in 28 minutes of action. Scofield on the other hand, was 8-of-9 from the field and 2-of-2 from the 3-point line. Barnes’ biggest gripe with his team this year at times has been about their effort on the glass. Against the Colonels, there was no reason to question the effort as Tennessee out-rebounded Eastern Kentucky 50-32. Williams has been the biggest target of Barnes when it comes to rebounding. The reigning SEC Player of the Year has improved in that department over the last couple of games, especially on Wednesday. Williams pulled down eight first half rebounds and tallied 11 on the night. His 11 rebounds were the most Williams has pulled down through six games this season. Along with Williams setting a season-high, Tennessee’s 50 rebounds are the most the Vols have pulled down in a game this season as well. The previous high was 49 in the season-opener against Lenoir-Rhyne. John Fulkerson added eight rebounds on the night while Kyle Alexander hauled in seven. Pons and Lamonte Turner each had five. With Pons receiving his first career start, somebody had to sit on the bench. That person was Bowden, who played 20 minutes in his first game off the bench. Bowden checked in for the first time at the 16:26 mark, and despite being replaced by Pons in the starting lineup, only played two fewer minutes. On the night, Bowden scored seven points on 3-of-7 shooting. He was 1-of-5 from the the 3-point line and hauled in one rebound. Barnes didn’t even explain to Bowden as to why he’s coming off the bench. He just informed him of the decision and moved on. “He’s had more opportunities than anybody,” Barnes said. “He’s had it pretty easy. I’ve coached probably everybody on the team harder than him because he’s one of those guys that’s normally doing the right things, but we think he can do more. Tennessee will be back in TBA on Sunday to take on Texas A&M-Corpus Christi at noon. The Vols will then head to Arizona for a showdown with No. 1 Gonzaga on Dec. 9.